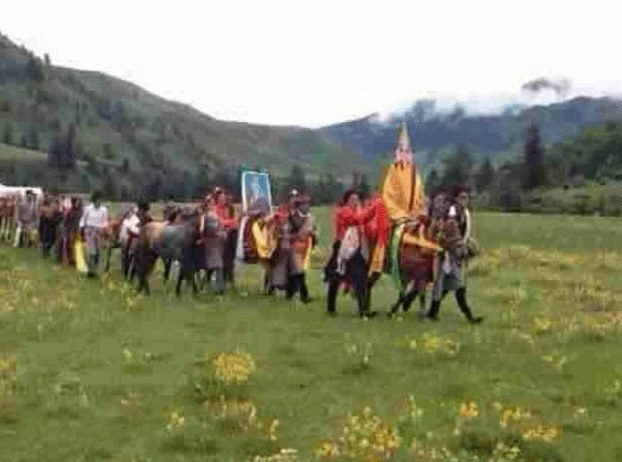 (TibetanReview.net, Aug01, 2014) –Despite an ongoing patriotism campaign especially targeting those exhibiting any form of loyalty to him, China has failed to prevent Tibetans from beginning a horse-racing festival in Bathang (Chinese: Batang) County of Kardze (Ganzi) Prefecture, Sichuan Province, with a formal display of obeisance to a large portrait of the Dalai Lama, Tibet’s exiled spiritual leader, According to Radio Free Asia (Washington) Jul 29. The festival was held on Jul 27 in the county’s Dziwa Village and the portrait was openly and formally installed on a throne, ignoring restrictions imposed by the Chinese authorities, the report said. The report did not say whether there was any immediate crackdown or arrest over the incident.